A couple of gardeners I know asked me why their cucumbers didn’t come up this year. Others have mentioned that their beans didn’t come up either. Was there something wrong with the seeds this year? After inspecting a few gardens, it became apparent to me what was going on. 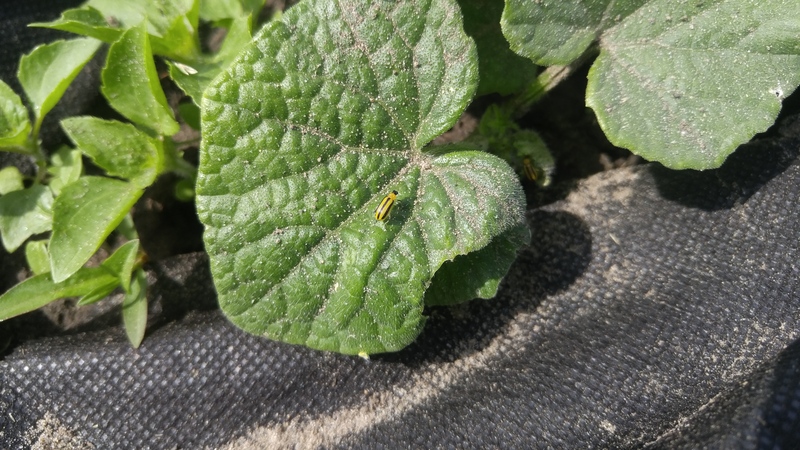 In each case, there was a heavy infestation of striped cucumber beetles. They are voracious feeders and are always on the lookout for their preferred food, cucumber vines and related plants such as melons and other vine crops. In those gardens, the beetles ate every plant they could find that tasted like a cucumber. The sprouts just emerging from the soil were particularly vulnerable which is why it appeared that the cucumbers didn’t come up — they ate every last bit of the tiny cucumber sprouts before the gardener knew what happened. And larger, young transplanted cucumber plants were well on their way of disappearing down the gullets of the beetles. When the vine crops were all gone, they moved over to the bean sprouts and ate those down to the ground. Even older bean plants had lots of holes in their leaves from the beetles. Striped cucumber beetles are about a quarter of an inch long. They have bright yellow bodies with distinct black stripes running the length of their wings. This was just the first wave of cucumber beetles, we can expect one or two more generations of beetles to show up later this season. This generation of beetles will lay its eggs at the base of the plants in the garden. Later they will hatch, feed on plant roots for a while then pupate and emerge as adults later in the season. The next generation of beetles will feed on the underside of the leaves and even chew gouges in the fruits. Even more important, cucumber beetles carry and will spread bacterial wilt, a serious disease of vine crops. Infected plants wilt and never recover. There is no cure for bacterial wilt once it infects a plant. It’s very disheartening to see your cucumber vines grow and begin to flower only to lose them to wilt. So it’s a good idea take care of cucumber beetles as soon as you find them. Hand picking doesn’t work because they can get away too fast. Instead, apply an insecticide labeled for cucumber beetles, most garden insecticides are effective against them.